Weight: 650 gm to 800 gms. An excellent selection variety of Muskmelon, orange fless, deep salmon, very sweet taste, good keeping quality, high yielding, maturity- 70-75 days, fruit weight is 650 gm to 800 gms. 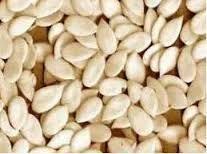 We are a renowned name that is actively committed towards offering qualitative Muskmelon Madhuras Seed. Our provided Muskmelon Madhuras Seed is available in various packaging options for our clients. 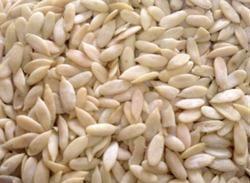 Our clients can avail from us a wide assortment of Muskmelon Seeds. These are dried, processed and are packed in the best possible manner. We are a well known names in the industry, in offering a wide range of Muskmelon /Cantaloupe Seeds. - Days to First Picking : 55 – 60 days after sowing. Usage: High Protein and protein rich,Enriched with Vitamins,Stronger Bones.